THERE ARE MANY images that are conjured when you think of Australia - sun, sea, surf, koalas. Skiing would not, necessarily, be in the top ten that would come to mind when thinking of the Great Southern Land. However, just one hour by air south-west of Sydney the Snowy Mountains opens up four ski resorts inside Kosciuszko National Park. Perisher and Thredbo are the premier resorts with the kind of slopes that will keep beginner and intermediate skiers happily occupied. 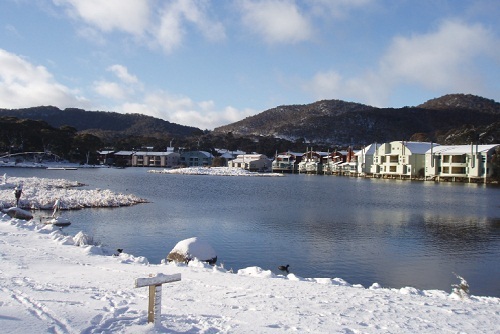 Spread out around a lake with views back up to the mountains , Lake Crackenback Resort offers guests easy access to both - each skifield is a short drive away and the resort's courtesy bus transfers you to the nearby Perisher Skitube - as well as plenty of off-slope luxe. Set on 61 hectares (150 acres), what strikes you instantly about Lake Crackenback Resort is the space. Although there are neighbouring chalets you really do not notice them as there is an overriding atmosphere of peace. It is enjoyable to walk around and experience the fresh mountain air, nature and the tranquil ambience of the resort in order to access the amenities; The Luxury Travel Bible even saw a large kangaroo while walking to the spa. The chalets are privately owned and offer a warm and homely feel - think warm colours, comfy sofas and stylish decor. This atmosphere really helped TLTB quickly transform from city-stress to resort-relaxation - not to mention a glass of Glühwein beside the open fire, enjoying stunning vistas of the mountain. After a site-inspection, it is clear that Lake Crackenback has enough varying types of accommodation to suit a range of skiers also seeking luxe. Couples would probably prefer the studios or the apartments overlooking the lake. Families and groups would fit well in the chalets (the chalet that TLTB stayed in had so many rooms that it took a few tours to get our bearings). Single skiers would suit the studios (although you could go all out, book a chalet and sleep in a different bed each night). One welcome feature is that each chalet is individual in design and decor which TLTB favours over cookie-cutter style resorts. After a full day of outdoor activity TLTB had worked up an appetite and felt no guilt when ordering from the extensive menu at Cuisine on Lake Crackenback Restaurant & Bar. The glass-fronted building overlooks the lake and lights on the opposite bank create a stunning view from the dining room at night. The menu is extensive which can make deciding on which dish tricky. Fortunately, the staff are highly knowledgeable about the menu and happily offer advice and recommendations. We can highly recommend the Wagyu beef. It is also tradition to follow the meal with a shot of schnapps (just to warm you up before heading out into the cold on your way to your chalet, you understand!). The schnapps is made at the nearby Wild Brumby Distillery and has flavours including chilli, butterscotch and mango. After undertaking research into the various flavours available Sour Apple remains a firm favourite for TLTB. Visits to the distillery and tasting can also be organised . Lake Crackenback has enough varying types of accommodation to suit a range of skiers also seeking luxe. Should restaurant dining not suit your party, or if you cannot tear yourself away from a night in front of your roaring in-chalet fire, the restaurant also offers a take-away service, Cuisine @ Home. There are also plans to introduce a lower key dining restaurant over the coming year and this will certainly make the resort even more appealing to those with families or for when you simply just want a bowl of good simple pasta. They are also the well-equipped, user-friendly kitchens in each of the chalets. One of the major benefits Lake Crackenback Resort has to offer is that there is plenty to do when ski-sore or if a member of your group is not a skier. I have to admit I am more at home in the spa than on the snow and TLTB definitely felt at home at The Spa at Lake Crackenback. The custom built spa has been designed to take full advantage of the stunning surroundings with large windows and each of the five rooms offering a different vantage point to view the beautiful scenery. The relaxation massage worked wonders on tired muscles after skiing the day before. The spa only uses 100% organic products which is an added bonus. Other activities on offer at the resort include fishing on the lake, mountain biking, bush walking, kayaking, archery and mini golf. Activites like this mean that while the main advantage of the resort will always be the close proximity to the ski fields in this area, there is also plenty to do throughout the year. Ski and clothing hire, ski tuning and a wide selection of ski clothing and accessories are available at the resort's ski hire shop, Harro's Snowsports. Owner David 'Harro' Harrison has over 30 years experience and the staff's passion and knowledge of snowsports is evident in the service. On-site there is also a small convenience shop with a surprisingly extensive range of products so there is really no need to go off-site. However, Jindabyne is nearby should you feel the need for any extra entertainment or supplies. Ultimate Luxury: The 24 carat Gold Facial - leave feeling more blinged-out than Cleopatra. Add on 'Bath Bliss' prior to your spa treatment. Therapists will draw you a warm infinity bath to gently ease away stress. Pure indulgence! The Little Things: Complimentary shuttle service to the ski tube makes getting from chalet to slopes in ski gear much easier. Resort ski lockers are available for guests at the tube meaning guests do not need to lug their gear each day. Junior Luxies: Kids club, babysitting and activities such as (spring free) trampolines, fishing and golf mean they will be entertained on and off the slopes. North Face and Columbia - dress for comfort and warmth. Smart casual for dinner.